Saturn has over forty-six moons in orbit around the planet. They range in size from a few kilometers in dameter to the largest moon Titan. Titan is larger than both Mercury and Pluto. The Cassini-Huygens mission was sent to study all of the Saturnian moons and Titan in particular. The mission is a cooperative project of NASA, the European Space Agency and the Italian Space Agency. 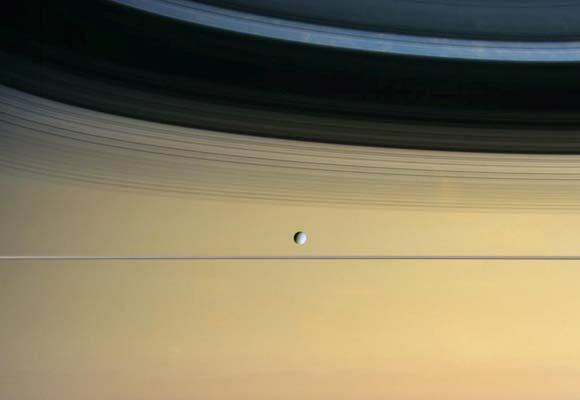 Our slide show is going to take a look at some of the most spectacular images that Cassini has sent back to Earth. This first image shows the tiny moon Dione with a pale yellow Saturn in the background. This picture should give you an idea how small all of these moons are in comparison to the planet. The surface of Dione, which has contrasting bright and dark areas when viewed up close, looks pale in this image. Clouds and swirls in Saturn's northern hemisphere can be seen within the faint shadows of the rings on the planet. Dione is 1,118 kilometers (695 miles) across and about 803,000 kilometers (499,000 miles) from the spacecraft.